Archie is the main character in the Riverdale netflix series and comic book Archie. He is friends with Betty Cooper, Veronica Lodge, Reggie, and Jughead Jones. He is the super jock as well as an aspiring musician. He got buff working in his dad’s construction business. In the first season he hooked up with his music teacher Ms. Grundy. He dates Veronica Lodge. He also dated Josie. He was life-long friends with Betty Cooper and Jughead Jones. He worked for Veronica’s dad before they had a falling out. He is not the Archie of the comic books. 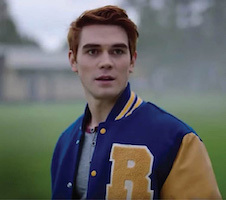 Find Riverdale Archie Andrews costume ideas below. This costume is best paired with Veronica Lodge, Betty Cooper or Jughead Jones. This look will make you into Archie, instantly! 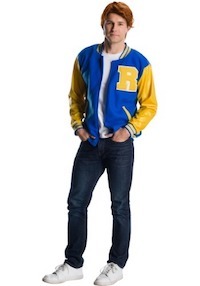 It features his signature Riverdale letterman’s jacket, in the school hues of blue and gold. You can pair it with your favorite denim and sneakers and you’d almostbe Archie. But to truly take on the moniker, you’d need the star’s signature fire-red hair! If dying your locks seems a bit…permanent…for your liking, this costume’s included wig will give you a sense of what it takes to look the part of Archie, easily. Now all you need is a Betty and Veronica on each arm for tonight’s party! Remember to get Archie’s hair. This is a great option to look like Archie. 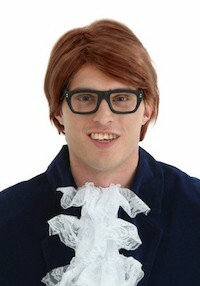 Click here to get Riverdale Archie Andrews Costume Wig. I know this doesn’t totally look like Archie Andrew’s smooth locks, but Archie can get wild once in a while. This is a great option to look like Archie from Riverdale. 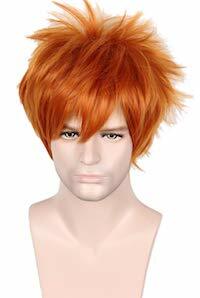 Click here to get the Riverdale Archie Andrews Red Hair.